Around two years ago, the weights program received new machines, everything from squat racks to dual adjustables. These new pieces of equipment allow students to participate in a multitude of activities and wide ranges of movements within a single instrument. Change in the weights classes wouldn’t be the same without a new coach. 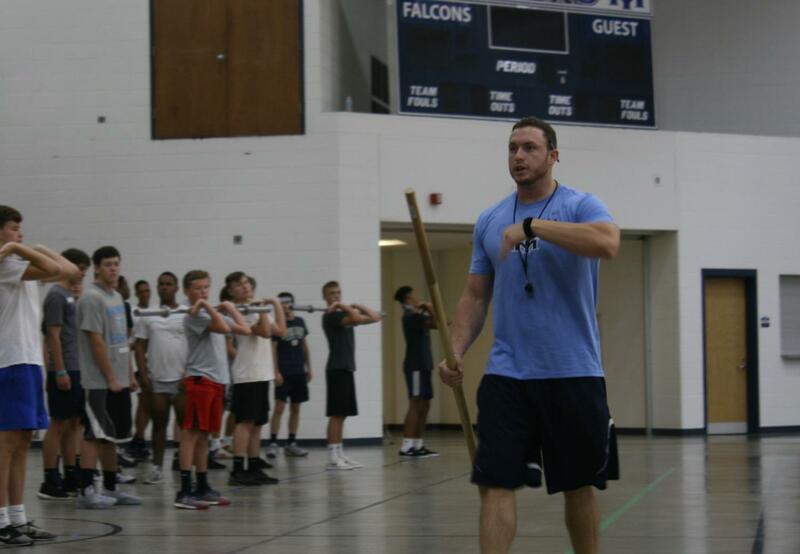 New strength and conditioning coach, Chris Massaro, comes to Perry Meridian this year after working as a conditioning coach at University of Indianapolis. With a new teacher comes many changes, comes a change in the way class is run. The classes are now separated by both sport and gender, leading to the class being coordinated directly to the activity. “It’s very team oriented and the direct teaching really helps,” says senior football player and wrestler Austin Lane. However, a some students don’t agree with the separation, stating that it changes the atmosphere of the weight room. Massaro also plans to concentrate on the athletic performance of the student athletes more than how much weight can be lifted. He favors the idea of good mechanics more so than rushing through to get to heavy weight and max outs. “I like how the body works,” says Massaro, in reference to the form of the class. One thought that was thrown out was the machines. With the remodeling, there were many machines placed in the room, but Massaro intends to transforming it to more of a free weight system, allowing the body to move freely, unconstrained by the machinery. In addition to the lifting, Massaro hopes to show a passion toward teaching the class. “Progression is important, far more important than anything else,” says Massaro. He prefers teaching the lifting mechanics and being connected as a coach, without technically being committed to a single sport. In the future, more changes are expected within the weight room, along with the possibility of eventually being only for student athletes. Athletes would be available to get in all lifting throughout the school day, allow them to be able to practice and focus on bettering themselves for the sport they are participating in. For now, Massaro favors the meaning of the workout to the athlete over the weight room itself.